Chinese airlines are turning their focus to Latin America at the direction of their government, which wants a global presence from its airlines. Air China serves São Paulo and Havana (which it considers part of Latin America), and in Apr-2017 China Southern launched Mexico City as a tag from Vancouver. HNA partially owns Brazil's Azul and Portugal's TAP, which HNA can feed into from a forthcoming Beijing-Lisbon flight on the HNA group carrier Beijing Capital Airlines. China Eastern has relied on codeshare access to Latin America but is now considering placing its own metal in the region. China Eastern is understood to be evaluating a nonstop Shanghai-Mexico City service, with a tag continuing to lower South America. China Eastern could work in partnership with Aeromexico for the service, and to obtain Mexico City slots. Guiding the development is Delta Air Lines, which has stakes in both Aeromexico and China Eastern. Growing examples of Chinese airline service to Latin America reflect a number of themes in Chinese aviation: profit is hardly the sole metric to evaluate value from an airline; there is a core central role of the government in airline planning; and there is a growing confidence of Chinese airlines to fly nearly anywhere. In exchange for fulfilling strategic directives from the government, Chinese airlines – especially the state owned ones – receive protection. Traffic between Latin America and Asia is growing fast but off a small base, limiting commercial feasibility. Intermediate airlines in Europe, the Gulf and North America have historically captured Asia-Latin America traffic flows and are well suited to doing so. Aside from Tokyo-São Paulo, the market between Asia and Latin America experiences fragmented traffic flows, limiting strong O&D pairs. Even if strong O&D volumes emerge, serving them nonstop is nearly impossible given the large distance between Asia and Latin America. Mexico City is a reach from Asia, and flying deep into South America from Asia nonstop is impossible with the current pipeline of aircraft. Subsidies and incentives have been critical for most new Chinese international services. This is true for Chinese airlines' international flights where they can "double dip" or dip even more, since they receive support from parties in China, an intermediate hub, and the Latin American point. With limited opportunities to fly nonstop from China to Latin America, intermediate stopover points will be used for most Chinese airline services. This creates an opportunity for airports and countries to secure more flights. The pitch is more difficult, since the commercial plan is more complex and the airport needs its government to line up stopover and, ideally, fifth freedom rights. Beyond traffic rights have often been an afterthought in China's air services negotiations. Although some foreign airlines may begrudgingly accept that their governments will grant broad third and fourth freedom traffic rights to China, fifth freedom rights are more contentious. For example, Canadian airports (Vancouver especially) would like Chinese airlines to use Canada as a stopover en route to Latin America, but airports have to balance this prospective offer with the wishes of Air Canada. Canadian airports are tied to Air Canada for their lifeblood, and upsetting Air Canada could mean that they lose services. Canada provides another example of complexity, in that beyond rights are limited. China has not succeeded in securing more third and fourth freedom traffic rights, so asking for more fifth freedom rights could result in them needing to reduce third/fourth freedom requests, or be prepared to offer more to the other party in exchange. Besides the matter of stopover rights, there is the matter of whether through transit is possible (complex in Canada, and not possible in the US). The next China-Latin America service could come from China Eastern. Air China and China Southern have existing services to Latin America, leaving China Eastern out as the only state owned airline without a Latin American service. China Eastern also does not serve Africa (Air China and China Southern do), so the airline is looking delinquent in fulfilling strategic objectives. However, historically China Eastern has lagged in long haul services so is catching up still. For a few years China has called on its airlines to fly to Latin America but China Eastern had tried to meet that expectation by having SkyTeam codeshares to the region. Now, however, China Eastern is considering placing its own metal into Latin America and is understood to be evaluating a flight nonstop from Shanghai to Mexico City, with a tag to a point in lower South America. Aeromexico flies nonstop from Shanghai to Mexico City (three times weekly on the 787-8) but on the return makes a stop in Tijuana. Mexico City's high altitude, limited runway length and the longer nature of flying westbound preclude a nonstop. It is understood China Eastern wants to fly nonstop in both directions by utilising new aircraft technology (in 2016 it ordered A350-900s and 787-9s). The Mexico City airport will further enhance operational feasibility. China Eastern regards Aeromexico as a partner and not a competitor. 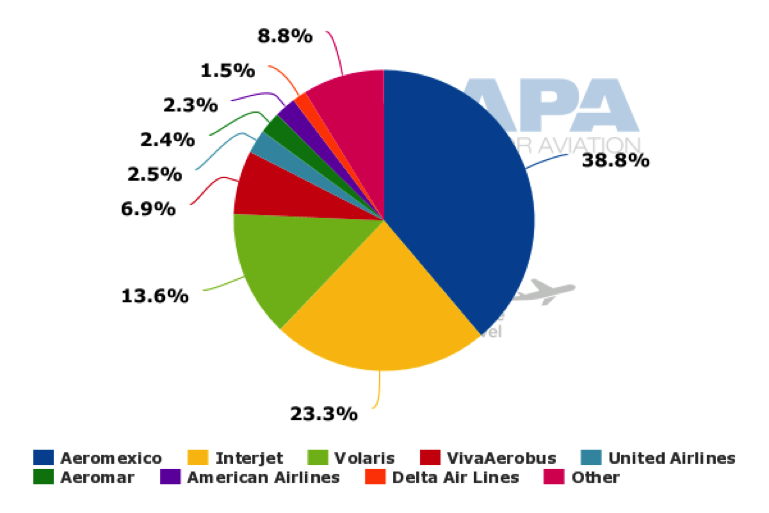 They can pool their schedules for a larger offering and leverage each other's hubs in China and Mexico; Aeromexico accounts for 39% of Mexico City's seat capacity in Apr-2017 according to OAG data. Aeromexico could also help China Eastern obtain preferred slots at the saturated Mexico City airport. Delta Air Lines has a gentle hand in this strategic development, since Delta has stakes in both Aeromexico (substantial) and China Eastern (small). The stakes are minority, of course, but Delta provides much greater strategic input. A China Eastern service to Mexico City would give Mexico City its second Chinese airline and third Asian airline passenger service. China Southern and All Nippon Airways launched services to Mexico City in Feb-2017. (Cathay Pacific has freight only services to Mexico City.) Aeromexico links Mexico City with three Asian cities: Seoul (from May-2017), Shanghai and Tokyo. Mexico City is China Southern's first point in Latin America. The airline launched Mexico City in Apr-2017 with three weekly 787-8 flights on a Guangzhou-Vancouver-Mexico City routing. China Southern does not have local pick up rights for Vancouver-Mexico City as it appears that Air China used the few available fifth freedom rights that China has from Canada to cover its Montreal-Havana tag. China Southern's three weekly Guangzhou-Vancouver-Mexico City flights brought its overall Guangzhou-Vancouver frequency to 10 weekly. Beijing Capital Airlines proposed a Beijing-Mexico City service to the CAAC, using A340s it would acquire just for those flights. This route application was made, along with other ambitious proposals, at a time when Beijing Capital was seeking to gain favour with Beijing authorities in order to be given high preference for Beijing's second airport at Daxing. Beijing Capital has since dropped plans to fly to Mexico City. Air China has China's oldest service to Latin America and the country's only service to lower South America. Air China opened Beijing-Madrid-São Paulo service in 2006. Air China flies the route twice weekly with the 787-9. Air China is the only remaining Asian airline in South America – after Korean Air and Singapore Airlines exited Brazil. Air China also flies to Havana. Although Cuba is technically part of North America, China considers Cuba part of Latin America from a strategic and cultural perspective. In Sep-2015 Air China started Beijing-Montreal service and in Dec-2015 it continued the flight to Havana. Air China did not launch the Havana tag at the same time as Montreal because it was apparently trying to persuade Beijing that the Havana tag should not be offered (or at least without a significant subsidy). The argument was run that it would be extremely unprofitable, and require large asset utilisation. Beijing, however, wanted a Cuba service for geopolitical reasons. As an indicator of the route's viability, Air China launched Havana three times weekly but then cut services to a mere once weekly flight, despite offering Beijing-Montreal four times a week. Although Air China is one of the country's three state owned airlines it is the only "flag carrier", and consequently has to fly more geopolitically important routes than do China Eastern or China Southern. Hainan Airlines, of the expansive HNA Group, is China's de facto fourth carrier of the national flag. 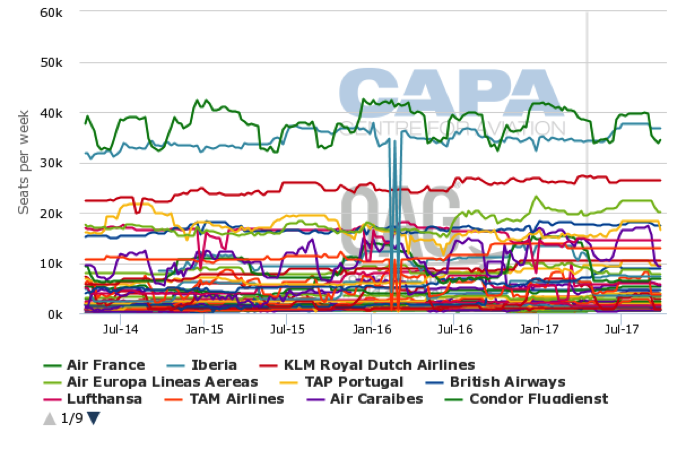 TAP is the fifth largest airline between Europe and Latin America, with approximately 15,000 weekly one ways and a 4.7% share. The market leader Air France has approximately 40,000 weekly one way seats. Still, TAP's Latin America is sizeable for HNA to link into. TAP does not serve Asia but HNA is planning a link between China and Portugal – the first flights ever between the countries. Beijing Capital Airlines plans to launch three times weekly Hangzhou-Beijing-Lisbon A330-200 service from 06-Jul-2017. This will enable HNA to offer Latin America connections via Lisbon, although details, and how well the connections work, are yet to be determined. There will be increasing route developments between China and Latin America but these will largely follow geopolitical requirements. Commercial sustainability will be challenging, even if Chinese airlines leverage connections and partnerships. In the short term, Latin America is attractive thanks to subsidies and lack of traffic rights to core long haul markets like Canada, the US and Germany. Open access to Australia and more traffic rights to France, New Zealand and the UK do present options, however. Open access to Australia and more traffic rights to France, New Zealand and the UK do present options, however. Those markets will continue to define Chinese airlines' long haul presence – and profitability.